The commercial frenzy of Black Friday is done, but now it’s Cyber Monday, that possibly-fictitious phenomenon of the heaviest day of e-commerce spending online. We’ll see. So far, it looks like it will be a strong holiday season for online commerce, as comScore’s tracking shows spending up 16 percent, mildly outpacing Forrester’s forecast for 15 percent growth. It’s a little early to get a clear reading on whether online is stealing holiday sales from the physical world. Brick and mortar retailers are trying to combat “showrooming” with price-matching and online-offline connections like in-store pickup. Walmart.com is aggressively promoting such tactics with TV advertising that extends Cyber Monday to a full “cyber week.” It’s easier to track online retail, so we may have to wait for earnings reports for confirmation of serious channel shift. 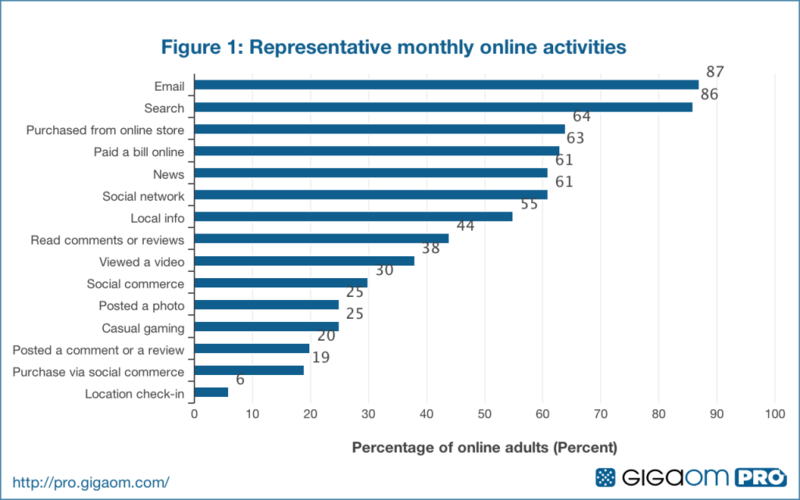 Even though online shopping and home broadband access are well established, shopping behavior continues to evolve. Mobile and social are this year’s buzzwords: mobile’s impact appears marginal but growing, but social commerce remains in serious flux. Mobile price comparison is a very real phenomenon, but does it lead to direct transactions? And are single-merchant or -retailer apps an effective vehicle for buyer lock-in? According to IBM analytics, mobile accounted for 16 percent of Black Friday sales. But the leading “mobile” shopping platform is the iPad, which is a living room rather than pocket device. Meanwhile, some are interpreting that Amazon and eBay apps – coupled with showrooming – are doing damage not only to physical retailers but to Google as well, as shoppers rely less on the big search engine. Interpreting this as a major disruption in search is probably premature, but this potential trend bears watching. Everybody’s down on social commerce, as defined by daily deals and flash sales. Well, not everybody. Hedge fund Tiger Global Management thinks Groupon is salvageable, and start-up Zulily, which offers deals for moms and kids, raised $85 million from Andreesen Horowitz. That’s in the face of Groupon’s flat growth, layoffs, and management turmoil, and Gilt Groupe’s strategy shifts while it searches for a new CEO. Is social commerce mainstream? The answer to this one is “almost.” Groupon is roughly the same age as Foursquare, and our GigaOM Research consumer survey data suggest daily deals usage is much more mainstream than local check-ins. Already, nearly half as many online adults visit daily deals and flash sales sites (30 percent) on a monthly basis as buy from online stores (64 percent) and 20 percent make regular purchases. Check-in is still a single-digit (6 percent) phenomenon. Is social commerce a new category? Unlike social gaming, social commerce does seem to be an original category. Zynga games aren’t really very social, and are used by the same audience that played earlier time-killing casual games like Bejewelled. What Zynga did was use Facebook for distribution. Groupon did, too, and admittedly, daily deals don’t depend on social sharing to get a certain volume of commitments before the deal goes live the way web 1.0 systems like Mercata worked. But reviews and recommendations give hints where Pinterest and Facebook stores could evolve. Where does social commerce fit in the e-commerce ecosystem? That’s the big question. Twitter does not seem to be driving many real transactions yet, even though its interest graph might be more predictive of buying behavior than Facebook’s social graph. Gifting probably won’t be a billion-dollar business for Facebook anytime soon – retail margins are thin, and impulse purchase opportunities limited – but it makes logical use of friend connections and personal data. Social media, including so-called social shopping platforms, may end up being a better source of data for merchants and retailers than they are powerful transaction engines. Where does social commerce fit in the online marketing ecosystem? See “data,” above. And regular readers are probably tired of my argument that Groupon should be a marketing rather than shopping platform. But I’ll make it one more time: Groupon could make better use of its saleforce and local merchant relationships by selling marketing services like display ads and paid search listings than it can selling them point-of sale systems. At the GigaOM RoadMap conference, GigaOM Research hosted a Mapping Session on “Next-generation UIs: What comes after Siri?” We wanted to take the pulse of conference attendees on what they thought were the market forces driving user interface innovation, and whether post-Jobs Apple would remain at the forefront. Even when thinking of UIs for enterprise applications, it’s useful to look to what can be learned from the gaming industry, which tends to set the standard for information and feedback, as well as deliver an experience that trains users in the application itself. Heads-up displays aren’t just for the military or Google science projects, but commercially available goggles don’t integrate much in the way of input or user control. Gesture-based input is mainstream already, but motion-based controls are just starting starting to emerge beyond gaming. Visualization of data requires more than a little art – and a lot of science. Audio can be used for immersive experiences as well as alerts and aural cueing. The feed-based UIs common in social media applications like Facebook and Twitter have already made their mark on enterprise computing, Pinterest-style image maps are showing up everywhere, and the latest “new new thing” is Apple’s Siri. Siri has been something of a bust – Apple overset expectations for a mobile personal concierge. The panelists concluded Siri was over-ambitious in its attempt to deliver a universal conversational UI. Siri is far more than voice input. It adds voice output, context-based search of multiple sources, and applications command. Attempting to deliver a user experience that depended on solving multiple technology “grand challenge” problems (speech recognition, speech generation, contextual search) was just too much to ask, even for Apple. GigaOM analyst George Gilbert observed that trying to force that combination into handling all the various tasks Apple was promising, rather than taking a more pragmatic, structured approach (like Google’s info cards or IBM’s single-function models), is the main reason we haven’t seen a Siri API for third-party application integration yet. Siri’s failure to deliver on its promise led the Mapping Session participants towards the conclusion that we’ll be seeing UI innovation on an app by app, or task by task basis. We probably won’t see a single technology, approach, or metaphor apply broadly in different contexts such as enterprise applications, in-vehicle command and control systems, or home entertainment. That doesn’t bode well for Microsoft’s efforts to apply Windows 8 conventions across phone, desktop, tablet, and console. 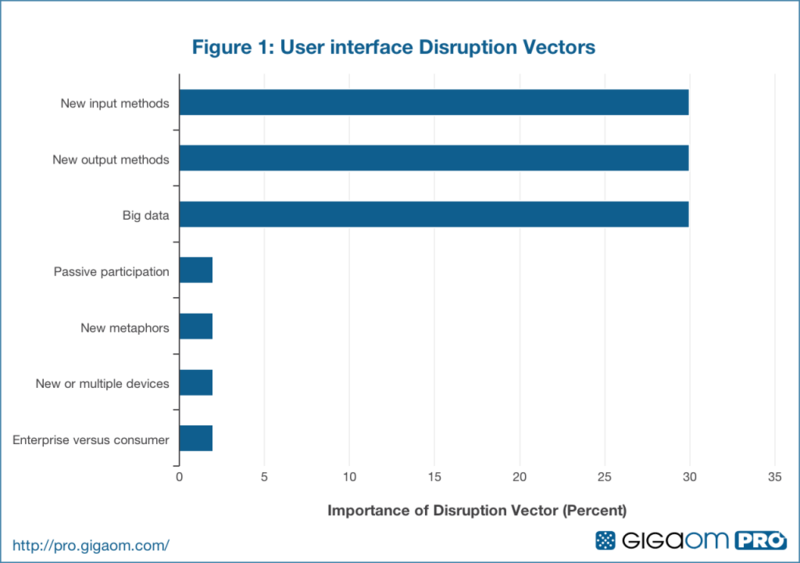 Similarly, the graphic above illustrates the consensus of the session participants as to the relative importance of Disruption Vectors in user interface innovation. Three different market forces seem to have equal weight, instead of a single dominating source. Input technologies include voice and motion – and neural connections – but also draw from the proliferation of sensors and the Internet of Things. They’ll bring valuable context to applications to feed the algorithmic analysis behind feedback and suggestions. Output. Besides the visual display of information, whether in augmented reality or decision support dashboards, UI innovation will come from companies that exploit suggestions and recommendations in a contextually appropriate manner to cut through clutter and accommodate small displays. Big Data technologies lie behind both of the above. Cloud-based data storage and access, along with APIs for apps to get at it, will dramatically reduce the effort of working across data silos, even as sensors and social media produce ever greater volumes of unstructured data. Cleaning and structuring that data is a huge opportunity for third party providers. Panelists and participants suggested other forces as potential UI Disruption Vectors, but none of them drove as much discussion. Automobiles aren’t the only place where passive participation while multitasking is a key factor in UI design. The file-and-folder metaphor is aging, and inappropriate for many entertainment or collaboration tasks, yet participants didn’t see timelines or other schemes as obvious successors. Session participants agreed that new devices and twin- or multi-screen applications are driving UI development, if not completely disrupting the space. And while there’s a tension between designing for business versus consumer functions, consumerized IT trends are already in play, and collaborative interfaces might be the bigger trend. We welcome your feedback on these trends, and on what might accelerate the development of user interface technologies. Have we missed or mis-emphasized anything that you believe will be key to driving the sector over the next 12 to 24 months? Continue the discussion by leaving a comment below. The slide deck we used to drive the conversation can be seen below, and it is available for download through SlideShare. LinkedIn’s sterling quarter shows that core social networks are good businesses. Notice I said “core.” Facebook has established itself as a critical communications and photo-sharing hub for consumers – regardless of the fact its platform technologies drive third-party businesses. There’s no equivalent “necessary” social network for commerce or local. LinkedIn lives off job networking, and looks irreplaceable. I’d still like to see proof LinkedIn is a professional communications or content necessity. And LinkedIn could do more about building a marketplace for selling business to business services. Martha Stewart Living Omnimedia’s trials and tribulations don’t mean that fundamental omni-media principals are wrong. MSLO was, from the start, a multi-media media company. It may eventually be digital-first sooner rather than later, but the company was built to leverage print, TV, digital, and even physical store presence. It reached its audience on multiple channels, sold ads and products across all, and vigorously cross-promoted. No, MSLO’s struggles are very traditional. Among media, it’s a truism that magazines are the most personality-based: They rise and fall based on the energy and buzz generated by the likes of Tina Brown (Vanity Fair, the New Yorker) and Rolling Stone’s Jann Wenner. Oprah and Martha are TV-centric examples. It seems like the popularity of the Martha persona may have run its course, and MSLO’s bench is thin. The company hasn’t tapped into social media currents as much as it should have, either. Students of media will remember the odd synchronicity of MSLO’s IPO on the same day as that of another modern multi-media company, World Wrestling Entertainment. WWE may not be at its peak, but it’s going strong.